Categories: Antiarrhythmic, C, Taj Brands. 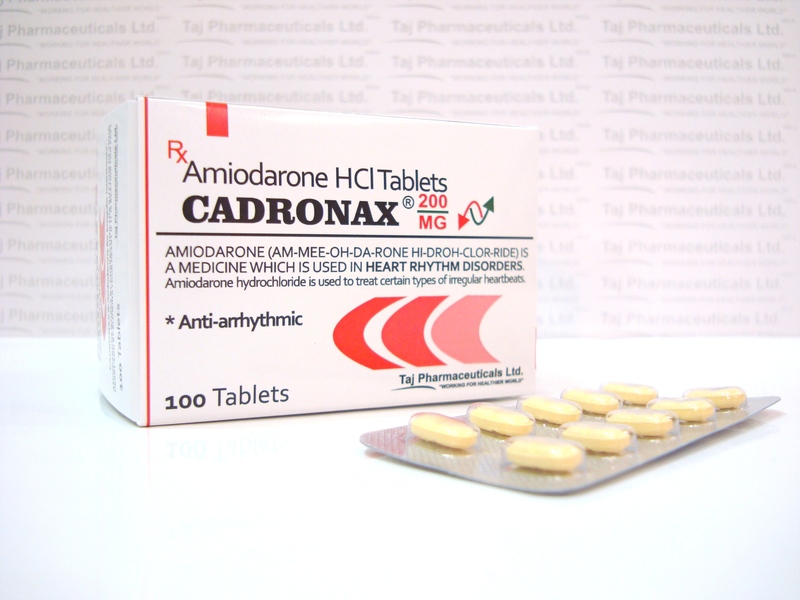 Tags: Antiarrhythmic, betamethasone, C, hydrocortisone, prednisolone..
CADRONAX belong to a group of medicines called anti-arrhythmics. They are used when the heartbeat is very irregular or very fast. They are only used for serious conditions which do not respond to other treatments or when other treatments cannot be used. 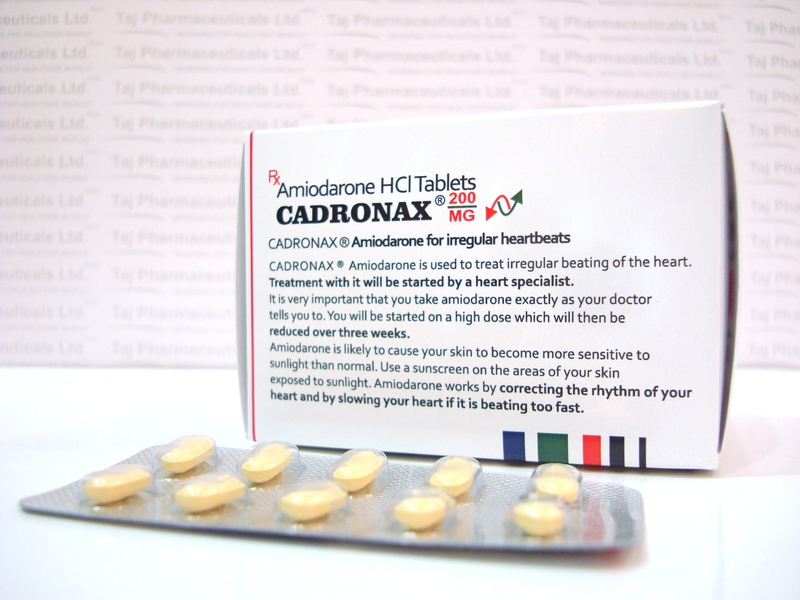 Treatment with amiodarone is normally under hospital or specialist supervision. 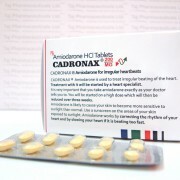 •	amiodarone or any of the other ingredients of CADRONAX. before and during treatment with these tablets. • digoxin (used for heart problems). 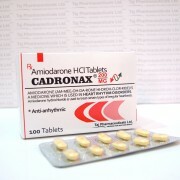 • certain medicines to treat high blood pressure and angina (chest pain) e.g. • lithium and tricyclic antidepressants (e.g. • flecainide (used to regulate the rate and rhythm of the heart). Please tell you doctor or pharmacist if you are taking or have recently taken any other medicines, including medicines obtained without a prescription. You should AVOID drinking grapefruit juice whilst on treatment with CADRONAX. Grapefruit juice contains some substances that can change the way these tablets work. You should limit the amount of alcohol you drink whilst taking these tablets. 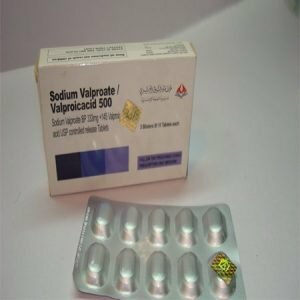 Do not take this medicine if you are pregnant, likely to become pregnant, or are breast feeding. 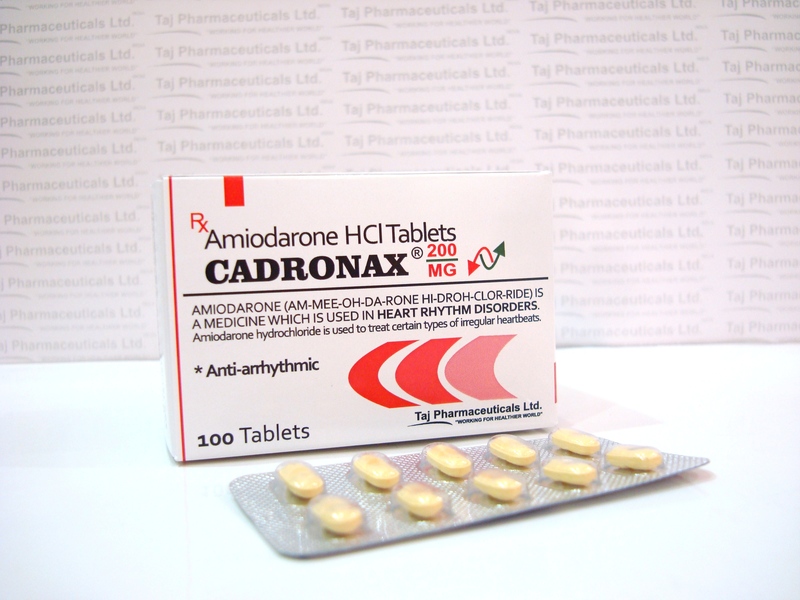 Amiodarone can cause eye disorders and blurred vision. If you are affected do not drive or operate machinery. This medicine contains lactose. If you have been told that you have an intolerance to some sugars, contact your doctor before taking this medicine. 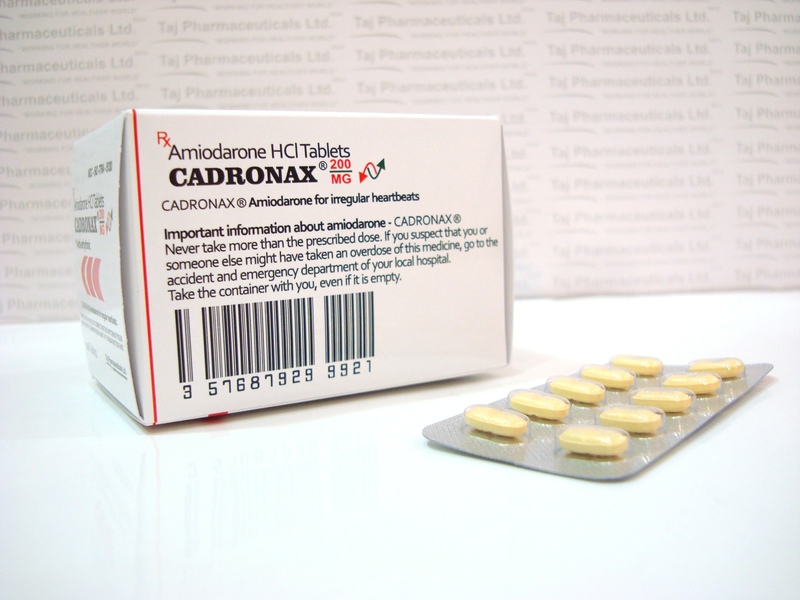 Always take CADRONAX exactly as your doctor has told you. You should check with your doctor or pharmacist if you are not sure. CADRONAX can be taken with or without food. In some patients this may be reduced to one 100mg tablet taken each day. Elderly patients may be prescribed lower doses. Your doctor will decide the correct dose for you. Keep taking your medicine until your doctor tells you to stop. Do not stop taking it because you feel better. If you have taken too many tablets tell your doctor or go to the nearest hospital casualty department IMMEDIATELY. Take this leaflet and any remaining tablets with you so the doctor knows what you have taken. If you forget a dose take it as soon as you remember. Do not take a double dose to make up for a forgotten dose. 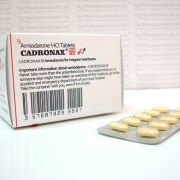 Like all medicines, CADRONAX can cause side effects, although not everybody gets them. Exposure to sunlight: Amiodarone can cause some patients to become sensitive to the sun or may cause a discolouration of the skin or a rash. You should avoid exposure of your skin to direct sunlight or sunlamps. You should take sensible precautions when you are in the sun such as wearing a wide brimmed hat and keeping arms and legs covered. Use a total sun block cream for exposed areas of skin. Occasionally, amiodarone may cause a grey or blue discolouration of skin exposed to light. If you are sensitive to the sun, then this may persist for some time after treatment stops. The following side effects have also been reported. Tell your doctor or pharmacist if you get any troublesome symptoms which you think might be side effects. • irregular pulse / dizziness. • inflammation of the veins and problems with the blood (you may notice bruising or nose bleeds). 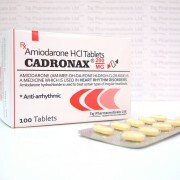 Do not use CADRONAX after the expiry date which is stated on the carton after EXP;. The expiry date refers to the last day of that month. • The active substance is amiodarone hydrochloride. 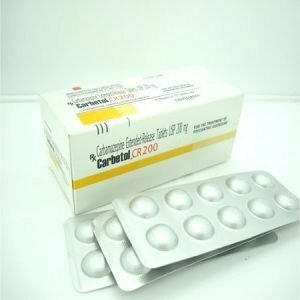 containing 100mg and 200mg amiodarone. • The other ingredients are lactose monohydrate, maize starch, povidone K90, silica, colloidal anhydrous, pregelatinised starch and magnesium stearate. 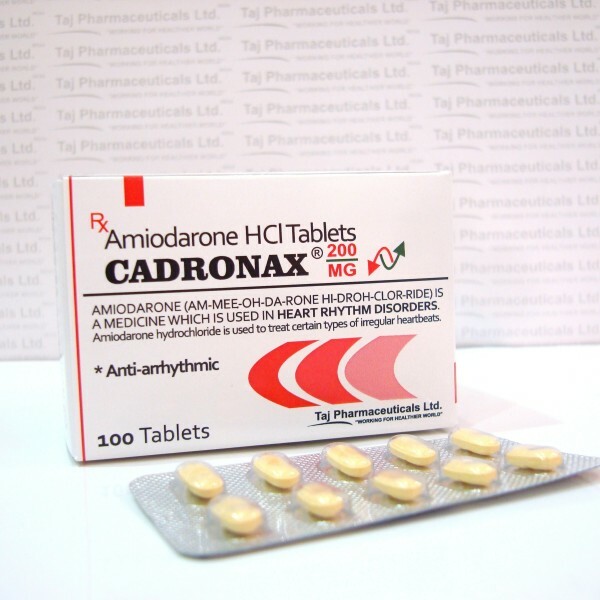 Amiodarone 100mg and 200mg Tablets are supplied in cartons of 28 tablets.